Opening Day was just around the corner. But the Detroiters whose hearts never left “The Corner” — the intersection of Michigan and Trumbull where baseball lived for more than a century at Tiger Stadium — were filing in to the Detroit Institute of Arts to honor a lost masterpiece. It was the closing day of the Freep Film Festival, and the museum was hosting a screening of Stealing Home, a documentary about the Navin Field Grounds Crew, an all-volunteer group of Michiganders who tend to the original ball field that survived the stadium’s demolition in 2009. The stands are long gone, but the patch of dirt where Ty Cobb, who scored the first-ever run at the original Navin Field with an intrepid steal at home plate, still remain. With a diamond picked clean of trash and an outfield stripped clear of towering weeds by the grounds crew, pickup baseball has returned to the Corner the past four seasons, as have scores of pilgrims from the Midwest and beyond, who travel there to stand at home plate, flipping the script on the city’s institutional neglect. Though fans lost the decadelong battle to preserve the stadium, hundreds of them still filed into the museum that Sunday in good spirits, their Verlander and Gibson jerseys tucked under layers of winter wear.1 Even the treasures lining these walls and corridors are no longer safe, as creditors continue to size up the museum’s holdings as collateral to potentially offset a portion of the city’s debt. The strength in numbers from baseball fans, groundskeepers, and museumgoers in attendance made a simple point clear: It takes more than a wrecking ball or art auctioneer’s gavel to crush the culture that defines Detroit. The story of the groundskeepers evokes a return to nature, a memory of baseball’s pioneering days in the Midwest, when oak groves were cleared to make way for wooden ballparks and wildcat fans on rooftops witnessed amateur nines develop into pro clubs before their eyes. A mile from the Detroit Institute of Arts, the first recorded baseball game in the city’s history — the Early Risers versus the Detroits — was played on August 8, 1859, in the vicinity of what is today Cass Park.2 For the next half-century, baseball teams battled for supremacy, and the Tigers — originally dubbed the Creams by local sportswriters3 — emerged as the focal point, with the Corner their stronghold. In 2010, when Tom Derry, a 50-year-old mail carrier in Redford Township, saw what had become of the field that begat so many memories, he took action, organizing a self-financed group to shred an urban jungle that had grown as tall as eight feet. 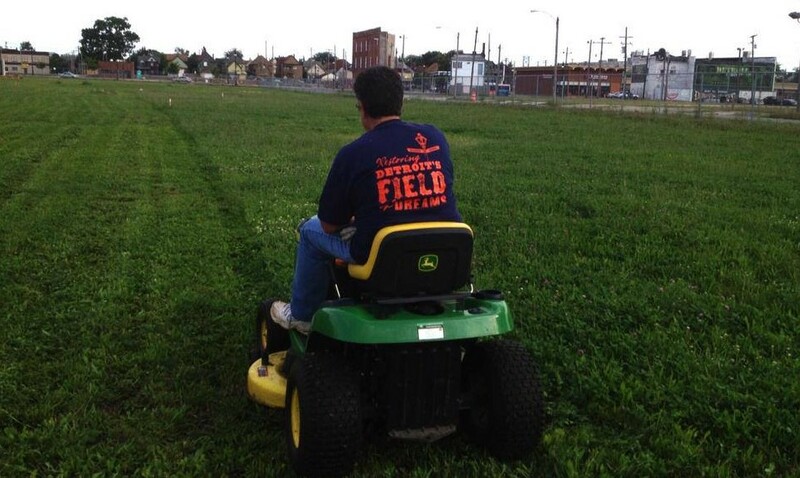 Derry’s volunteers engage in a kind of graffiti in reverse, with crew members swooping in to groom the field before being instructed to vacate by the Detroit police. Even the police on the beat have, at times, expressed reluctance to treat the NFGC as trespassers; many share the community’s view that the historic site should be preserved.4 Four years later, the field has hosted pickup games, Father’s Day throat lumps, wedding vows, historic reenactments, Sunday barbecues, and scowls from developers who want to pulp these memories for profit. With Derry’s encouragement, I drove from Chicago to Detroit to see the field and a screening of Stealing Home firsthand. When I conceded I was a White Sox fan, Derry graciously shared my lament that both Comiskey Park, the onetime Baseball Palace of the World,5 and Chicago Stadium had been leveled and transformed into parking lots in service of soulless replacements across the street.6 When Comiskey faced the wrecking ball, Derry was there, clunky ’80s camcorder perched on his shoulder, documenting the destruction. He can rewatch the VHS footage of Comiskey being leveled, he notes, but never Tiger Stadium. The scars were still healing among the fans at the DIA that Sunday, though the mood was comforting. In the second-floor lobby, Tigers legend Willie Horton reminisced with early arrivals about the old ballpark. He stressed it was the fans and the ushers and the grounds crew — a nod to the Navin Field crew members circulating the theater, Jedi-like, in matching hoodies — who made him understand the stadium’s true scope. His words carried weight; Horton grew up in the shadow of then–Briggs Stadium in the Jefferson Projects. When asked about his favorite Tiger Stadium memory, he recounted the ball he hit into the 440s during his second at-bat. When he tracked down his family after the game, he was told his father had missed it — after a skirmish in the stands, he’d been sent to stadium lockup. A laugh rippled across the room, followed by a hush. A sense of homesickness seemed to set in. The prevailing sentiment: That would never happen at Comerica. In the theater, there was a convention atmosphere when a group of ballplayers dressed in 1860s garb filed down the aisle and converted a section of seats into a makeshift dugout. Known as the Regular Base Ball Club of Mount Clemens, the team plays gloveless ball with 19th-century rules at the Corner, with assistance from the grounds crew. The vintage uniforms came in handy during the after-show Q&A, when a team member passed his cap, which the audience stuffed with hard-earned twenties — alms in the form of gas money to keep the groundskeepers’ lawn mowers running. A majority of the theatergoers bypassed questions and simply offered their thanks — for keeping the Corner alive, for tending to the sacred ground where they once sat shoulder to shoulder with their long-lost fathers. A photographer in the front row turned to the audience and implored them to view the corner of Michigan and Trumbull on Google Earth so they could see how beautiful Tom Derry’s efforts look from space. As I joined the grounds crew gathered near the pitcher’s mound, Derry in particular was apologetic about the field’s appearance. Endless snowfall from the “worst winter ever” had thwarted their usual springtime preparations.12 In February, the snow was so thick, crew member Bart Wilhelm adorned the field with nine snowmen, each in its proper defensive position. The snow had since melted, but a recent St. Patrick’s Day parade down Michigan Avenue clogged the perimeter with litter. Making matters worse, someone had slipped a pack of dogs past the gates earlier in the week, and paw prints now covered every square inch of Cobb’s old base paths. The flagpole also serves as a kind of core sample to chart bygone eras. There are three layers of paint on the pole, the crew members noted, starting with the most recent gunmetal gray. Beneath that is blue paint from the 1977-99 seasons, preceded by green from Briggs Stadium and Navin Field. The reason the pole is still gray today is that Billy Crystal used the stadium as a double for Yankee Stadium when he filmed 61* in 2000. The pole was never gray in its playing days, just during its brief turn as a stand-in on HBO. Considering the land was a Civil War–era picnic grounds and hay market, I wondered if Derry had reached out to Detroit’s community of urban farmers about pooling resources. Derry made clear he’s a proponent of urban farming, but prefers that the site remain a ball field. As a point of comparison, the NFGC looks to the Bronx, where the site of old Yankee Stadium, which is approximately the same size as the Tiger Stadium site, now offers three diamonds for public use: a Little League diamond, a softball diamond, and a major league diamond. The crew members note, however, that the major league diamond is not in the exact same location as the original Yankee Stadium. 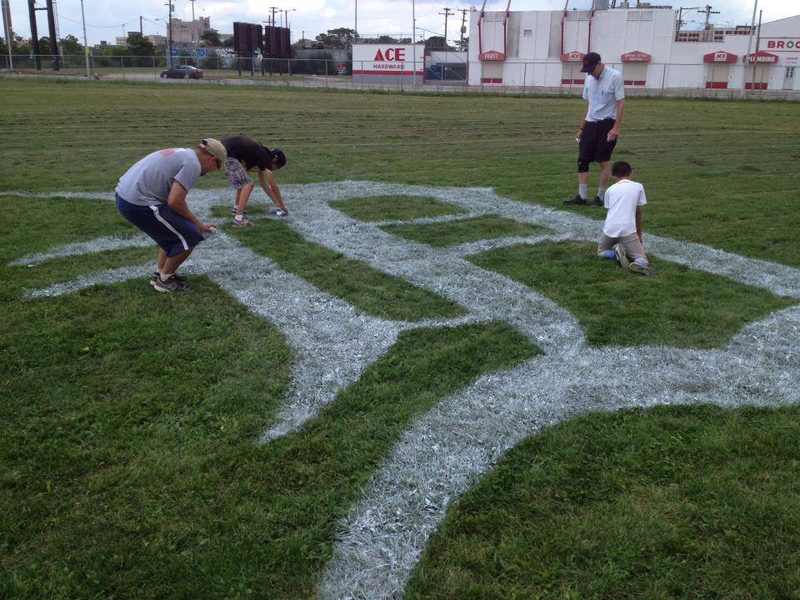 In Detroit, they feel there is a unique opportunity to preserve the historic major league diamond, while still leaving plenty of room for Little Leaguers to roam the same field where greats like Hank Greenberg and Sweet Lou Whitaker played. The following week, I called Derry after Opening Day for a rundown of the fourth inaugural at the Corner. “Hundreds of people came by to visit the old ball field,” he said. “Many of them stopped by on their way to Comerica, and some just to hang out on the field, throw the ball around.” The first game of the year was played, a cross-generational scrimmage between a men’s senior league and a high school team from nearby Cass Tech. Even more encouraging for Derry, however, was seeing the new crop he needed most lining his freshly chalked field: volunteers. 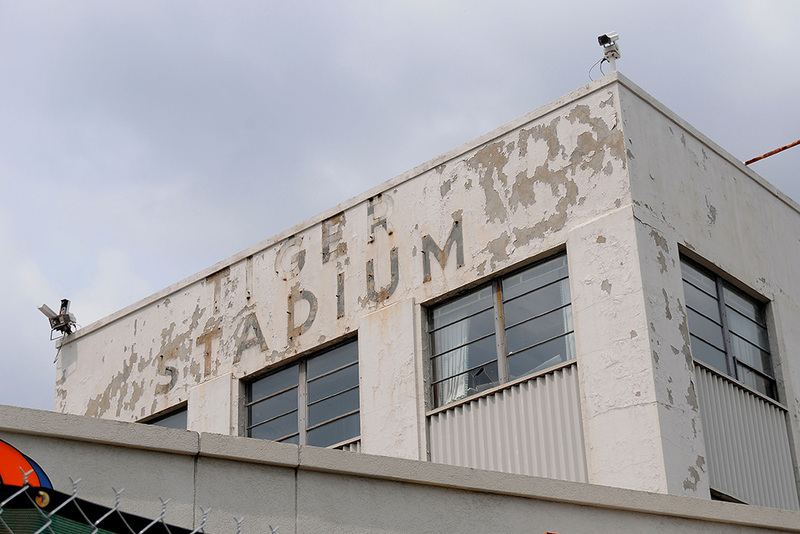 This is according to Richard Bak’s definitive book, A Place for Summer: A Narrative History of Tiger Stadium. A point of pride for Derry is that his maintenance allows an unobstructed view across the lot, making patrols of Corktown, the neighborhood that Tiger Stadium called home, a bit more manageable. The park boasted the nickname in 1910. Says Derry, “I loved Comiskey Park. It reminded me of Tiger Stadium. It didn’t need ivy growing on the walls; it didn’t need a Green Monster.” Incidentally, Fenway Park and Tiger Stadium (then Navin Field) opened on the same day, April 20, 1912. A migration to admire is Maple Leaf Gardens in Toronto. The original building still stands and accommodates college hockey (and a grocery store), while the nearby Air Canada Centre hosts the relocated Leafs. One of the more striking moments in Stealing Home finds groundkeeper Joe Michnuk sifting through bequeathed bone fragments with bare hands. It was announced the next day that Stealing Home claimed the audience award at the Freep Festival. Full disclosure: Mesrey is a former Grantland copy editor. Thompson was the owner of Detroit’s first Major League Baseball team, the Detroit Wolverines (1881-88). It felt appropriate visiting these grounds on a Sunday, given the day’s importance to team history. Irritated by the city’s blue laws that banned ball games on the Sabbath, the Tigers traveled outside city limits to play at Burns Park in 1901 and 1902, cultivating a broader — and decidedly defiant — fan base. Derry stressed that he’s been on disability leave since August 2012 and has had to delegate more cleanup duties than ever. Derry mentioned that the Old Tiger Stadium Conservancy was able to secure $3.8 million in federal redevelopment funds in 2009 with the help of U.S. Senator Carl Levin. “That wouldn’t even begin to pay for all the buildings — housing, retail, office space — that the DEGC want to put up,” he concluded.